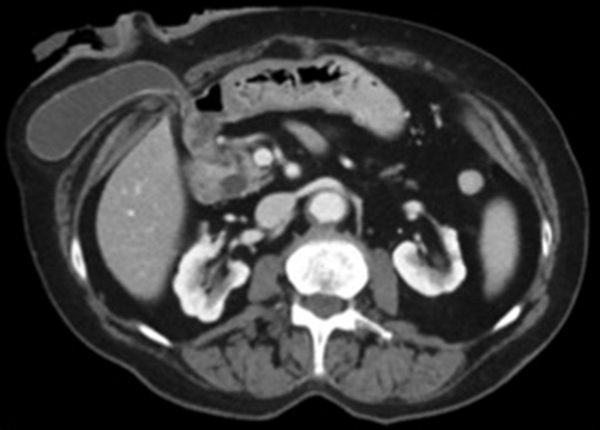 Ms JM, a 75-year-old female presented to a tertiary hospital emergency department with colicky right upper quadrant abdominal pain that had increased in severity and frequency over a week. This was associated with pain radiating to the back, as well as intermittent nausea and vomiting. She had previously undergone open subtotal colectomy and formation of end ileostomy for sigmoid volvulus two decades ago. This was complicated by recurrent parastomal hernias requiring surgical repairs which included local repair with mesh, repositioning of the stoma to left upper quadrant then finally to the right upper quadrant. She had a BMI of 31.2 kg/m2. On clinical examination, there was evidence of a large irreducible parastomal hernia associated with the end ileostomy in the right upper quadrant. Contained within the parastomal hernia, there was a firm palpable mass. The stoma appeared healthy and was reported to be functioning well. Subsequent Computed Tomography (CT) of the abdomen and pelvis revealed a parastomal hernia containing the gallbladder. There was no evidence of cholecysitis or choledocholithiasis. CBD was dilated to 9 mm without any filling defects. Surgical management was decided after discussion with the patient. Intra-operatively, a transverse incision lateral to the stoma was performed. The Hernia sac was identified and its contents were inspected. 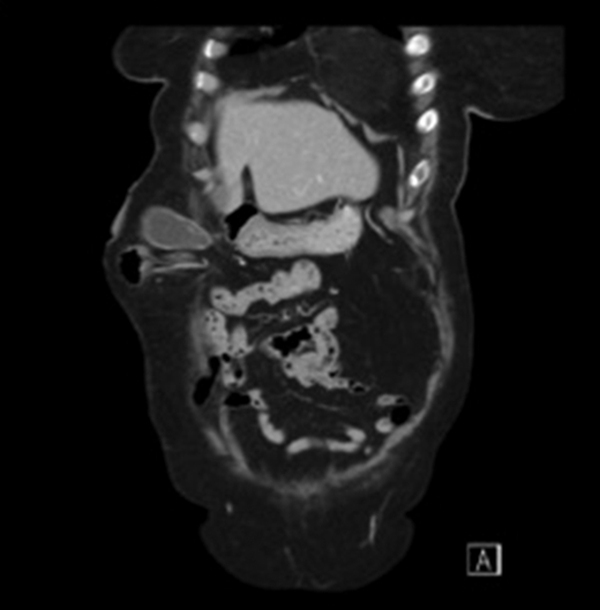 Among small bowel loops, the gallbladder was present within the hernia sac. The Gallbladder was not inflamed or ischaemic and was easily reduced into the peritoneal cavity. 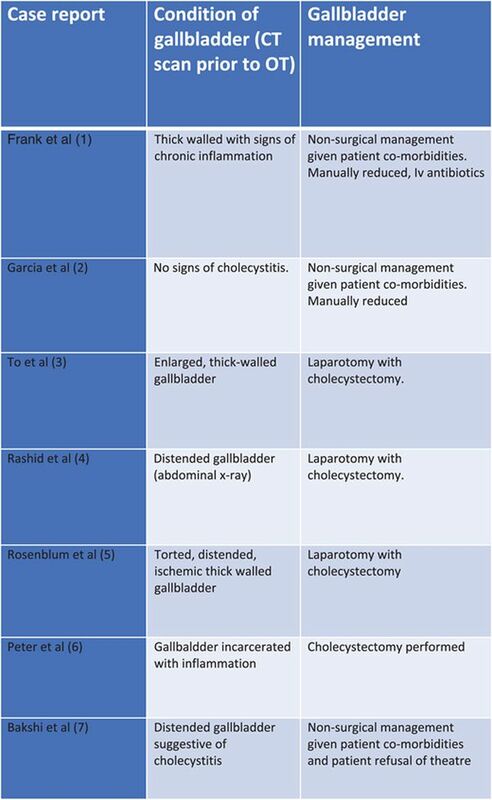 No cholecystectomy was performed. The parastomal hernia neck was tightened and onlay mesh (ULTRAPRO® Ethicon, USA) was used to reinforce the parastomal hernia site. She recovered well post-operatively without immediate complications and was discharged home 4 days after the operation with oral analgesia. At her 6-month outpatient clinic review, no recurrence of parastomal hernia was noted.